Film Preservation can mean different things to different people. The movie palaces where the classic movies were shown are part of the picture. I have written this week about nitrate film. Today I’ll take you to two theaters that survived the nitrate era but couldn’t survive the changes in values that made them obsolete before the end of the century. One of them is not completely gone, but lingers in a netherworld of changed purpose. My friend Tim Caldwell took me to the theaters. We started by driving into a parking garage in downtown Detroit and continuing up to the top floor. Above us was the ceiling of a movie palace. In 1976 the Michigan Theater had been partially demolished and turned into a parking garage. The ceiling had once hung over an auditorium holding four thousand seats. The sides of the ceiling curved downward until they were truncated by the concrete floor of the garage. On a lower floor I saw a balcony that still had seats in it. On the street side of the building the lower floors did not span the width of the old theater. Instead they stopped at the edge of the original lobby. That gave the lobby its original four story open height. It gave me a clear view to the ornate lobby ceiling from the original perspective of a ticket buyer. The Michigan had been built on the site of Henry Ford’s 1892 garage. It was the garage where he built his first car. It seemed appropriate that the theater had become a cathedral where Henry Ford’s progeny now came to worship their creator. The Michigan was a movie palace of the very grand type. It was designed by Rapp and Rapp of Chicago and was the largest theater in Michigan. It had a full stage for vaudeville. Benny Goodman, Frank Sinatra and Judy Garland, among many many others, appeared there on stage. In the early seventies it became a Rock and Roll venue. Kiss, T-Rex, ZZ Top, Sly and the Family Stone, Iggy and Stooges and many others performed there. The only reason it was still in existence, such as it was, is that it was cheaper to turn it into a car park than to demolish it. To make the irony even more piquant, the Ford garage has also survived. It was moved by Mr. Ford’s to his Greenfield Village. If you’ve never been there, or to his nearby museum, I suggest you go. Mr. Ford didn’t just move his own garage there. He also moved Thomas Edison’s Menlo Park Laboratory, the Wright Brother’s cycle shop, the courthouse in Logan, Illinois where Abraham Lincoln practiced law, nearly 100 other historical American buildings, and arranged them all in a village setting. In his nearby museum he has an incredible array of Americana including the assassination car of John F. Kennedy, the assassination chair of Lincoln, the bus in which Rosa Parks refused to give up her seat, and so much more. Our next stop was the Grand Riviera, a huge atmospheric theater designed by John Eberson. It was in a neighborhood a little way out of downtown. It had been built by the Nederlander family. The Nederlanders started in Detroit before becoming the biggest theatrical producers on Broadway. Tim told me that the first time he had been in the Grand Riviera he had found Nederlander ephemera strewn across an office floor. There were personal letters, post cards from sons serving in the second world war, and business correspondence. He also found a program signed by six members of the Baseball Hall of Fame and Jim Thorpe. Both the sentimental and the collectible were equally devalued. From a distance the Grand Riviera looked like it had been casually walked away from, many years before, being left to gently fade away rather than suffer the indignity of the wrecking ball. The effect was that of Blanche Du Bois’s faded Southern belle, or Miss Havisham’s wedding cake. None of the upper windows were boarded up to spoil the effect. The big vertical sign was still there with most of the neon gone. We parked on the street and walked through a vacant lot, overgrown with waist high brown grass, around to the back. Tim walked to a weathered piece of ply-wood leaning against the back wall and pulled it aside. A black hole appeared before us. He then reached into his bag and pulled out two flashlights, a hunting knife and a tire iron. He handed me one of the lights and the iron. He said “Sometimes you disturb a bunch of vagrants when you go into a place like this. You just show them the weapons and they leave you alone.” With that caveat, we crawled through the hole. I thought of soldiers crawling into Viet Cong tunnels in search of the enemy. Once inside he stopped and reached back through the hole pulling the ply-wood over the opening. “It’s just as well people don’t know we’re in here” He whispered. Once we were inside we could stand up. We were underneath the stage. Tim walked forward like he knew where he was going. We were on a path between pieces of old theater seats and other debris piled high. The flashlights cut the darkness but left shadows lurking outside the light. We came to a short flight of stairs with a door at the top. That took us into the auditorium beside the orchestra pit. Atmospheric theaters were designed to give customers the impression of being outdoors in an exotic courtyard. The illusion was created through ornately decorated walls against, what were at first blush, unadorned ceilings. Through carefully designed artifice the ceilings became night skies complete with twinkling stars, passing clouds and a moon. The cloud and other effects were created through a special Brenograph “atmospheric projector” made by the Brenkert Company. We walked down a side aisle between an acre of unoccupied chairs. There was a curious half light in the auditorium. I looked up. Small holes in the ceiling let in tiny shafts of light. There were thousands of them, and together added up to just enough light to see by. Our steps had raised a thin cloud of dust. It hung in the air with the pin pricks of lights refracting through it. The walls were decorated with several Egyptian tomb figures of huge unsmiling men. They looked forty feet tall. A couple of them had fallen down. They had tumbled forward, broke into several pieces, and lay sprawled across dozens of seats. We walked into the lobby. Everything of obvious and easily carried away value was gone. It was filled with trash. Looking past that I could still sense the glorious beauty it had once had. The lobby ceiling was four stories high. From the middle of the lobby ceiling a long chain hanged down that had once held a huge chandelier. A lot of marble had been used in the décor. We poked around in various store rooms, offices, dressing rooms, and rest rooms. Tim told me that the first time he had come into the place he had forced his way into a narrow room and had found movie posters from the 1920’s. They had been stuffed into a space where two walls joined together. Tim also found another old movie poster by crawling up into a false ceiling. On a later visit he came across huge, three sheet and six sheet, posters for Kitten With a Whip, The Hustler, and other sixties movies. The only thing I found to take away was a small metal sign, about a foot long and five inches high. It was a no smoking notice, with the fire department directors name at the bottom. He had probably served during the Hoover administration. We walked out of the theater the same way we had come in, at last crawling, through the hole into bright sunlight. I was immediately struck by the heat. It had been cool inside. It had been like being in the ruins of a cathedral of a forgotten religion. It had been like being in a another time. We drove back to town through a neighborhood that had deteriorated along with the theater. Many of the storefronts along the four lane street were boarded up. Others contained businesses of dubious financial means. The only ones that appeared flourishing were the fast food franchises. Popeye’s Fried Chicken, White Castle, MacDonalds. Businesses that hadn’t existed when the Grand Riviera had hosted thousands of customers a night. We were a long way from Depression glass dish give aways and Shirley Temple look-a-like contests. People in the neighborhood now stayed home at night, watching TV and videos, many of them afraid to walk the consequently deserted streets. 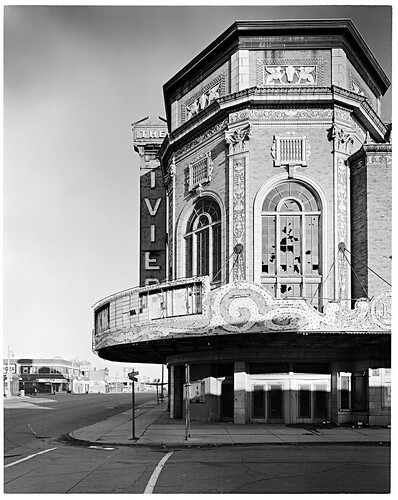 The Grand Riviera Theater was demolished in 1997. Damn, cool website. I actually came across this on Google, and I am happy I did. I will definately be returning here more often. Wish I could add to the post and bring a bit more to the table, but am just absorbing as much info as I can at the moment. Hello, เกม I came on this while searching on aol thanks for sharing. im kinda sick of the battery on my droid going down so fast, it annoys the crap outta me, see what happens, find a good site and BAM my battery is dead, so yeah, i luckily had enough battery to read this and post the comment haha, i have no life. yay me! Just desire to say your article is as astonishing. The clearness for your post is just nice and i can assume you’re an expert on this subject. Well together with your permission let me to grab your feed to keep updated with imminent post. Thank you one million and please carry on the rewarding work. Thanks for the kind words. Sure, grab the feed! It has been a pleasure for me to read this post. Good Stuff! Your article of the Grand Riviera brought back memories my one and only visit in October 11, 1969. I came to see the Who in concert and the back up band was Alice Cooper, who at that time was unknown to anyone outside Detroit. My friends and I thought Alice cooper was a folk singer…Boy, where we suprised. It has been almost 42 years ago but I can remember it clearly. Thank you for bringing back some fond memories. I’ve been looking up information about John Eberson since a weekend visit to the Palace Theater in Marion, Ohio introduced me to atmospheric theaters and piqued my interest. I had to learn more! The thumbnail of your parking garage photo came up in a Google image search snd I had to see the story behind it. You don’t know how much I would love to have tagged along on your excursion in Detroit. At least with your terrific description here, I have some great mental images in addition to the photos of the garage. Great blog! Its great as your other content material : D, appreciate it for posting . Hi, nice website with very interesting articles. Fantastic goods from you, man. I have remember your stuff prior to and you are just too great. I actually like what you’ve received here, certainly like what you’re saying and the way during which you are saying it. You are making it entertaining and you still take care of to stay it smart. I can not wait to learn much more from you. This is really a tremendous web site. WOW! I went to the Grand Riviera in Oct-Nov 1969 to see Joe Cocker & the Grease Band (Russ Gibb called it “The Grande Riviera”). What great memories and your trip inside was very informant. I beg of you for all more pictures! Lived on yosemite and Boston ( my bedroom window faced the back of the Riviera) and would love to have more pictures.